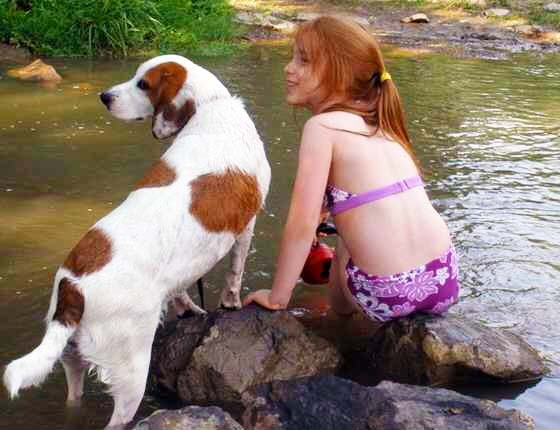 Well, really, my granddaughter Leanna and her dog, Bella. The resemblance is striking, though. Next time I see her, I'm going to check for fins. "13Usually we do not comment on technical and grammatical errors, because anyone can make such an occasional mistake, but here the miscues are so egregious and obvious that an average fourth grader would have avoided most of them. For example, the word “principals” should have been “principles.” The word “vacatur” is misspelled. The subject and verb are not in agreement in one of the sentences, which has a singular subject (“incompetence”) and a plural verb (“are”). Magistrate Judge Stickney is referred to as “it” instead of “he” and is called a “magistrate” instead of a “magistrate judge.” And finally, the sentence containing the word “incompetence” makes no sense as a matter of standard English prose, so it is not reasonably possible to understand the thought, if any, that is being conveyed. It is ironic that the term “incompetence” is used here, because the only thing that is incompetent is the passage itself. -U.S. Court of Appeals for the Fifth Circuit, No. 10-10325, Samantha Sanches v. Carrollton-Farmers Branch Independent School District, in which a Texas cheerleader and her mom get pwned by three Federal judges who describe the suit as "a petty squabble, masquerading as a civil rights matter, that has no place in federal court or any other court."